Once we're able to rely on renewable energy sources for our power consumption, the top 50% of the dirtiest power generation resources could retire early. We would have a cleaner, smaller, and more resilient energy grid. With renewable and alternative sources of energy high on his priority list, Prime Minster Narendra Modi on Saturday paid a visit to the headquarter of Tesla Motors at Pao Alto to get a feel on what could drive the automobiles in the future. PM Narendra Modi also showed keen interest in some of their path breaking inventions, particularly in the renewable energy sector which can have multiple applications in remote rural areas. Tesla Motors, Inc. is an American automotive and energy storage company that designs, manufactures, and sells electric cars, electric vehicle powertrain components, and battery products. Tesla Motors is named after electrical engineer and physicist Nikola Tesla. Tesla is not just an automotive company, it's an energy innovation company. Tesla Energy is a critical step in this mission to enable zero emission power generation. After touring the iconic American automotive company's campus, Modi tweeted how he was impressed by the power wall technology of Tesla Motors which stores electricity in a battery for long term. "Enjoyed discussion on how battery technology can help farmers," Modi said after his hour-long visit to Tesla campus wherein he was given a tour by its CEO Elon Musk. Musk said that he had a "great discussion" with Modi about solar and batteries empowering rural communities. "For India the main take away was the technology behind long term storage battery, which can have multiple applications," said Vikas Swarup, spokesman of the Ministry of External Affairs. "The Prime Minister was very keen to see how we could utilize the battery - the power ball concept - to leap frog development in India," he added. During the meeting, Musk gave a presentation to Modi on the revolutionary technologies being developed by Tesla, which is likely to change the face of the motor industry and have wider implications on developing countries like India on renewable energy. "Musk and Prime Minister Modi discussed Tesla's developments in battery technology, energy storage and renewable energy and the positive implications of this innovation for India," Tesla spokesperson Ricardo Reyes told PTI after Modi's trip. 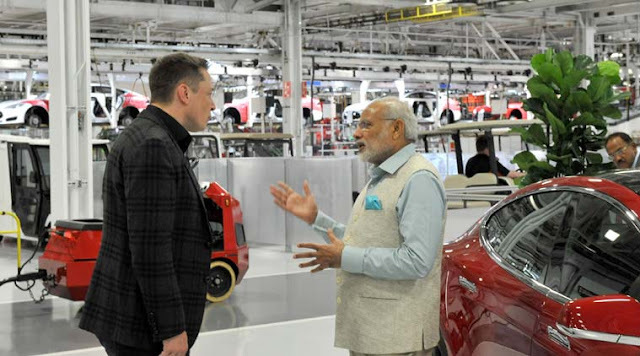 "We were delighted to host Prime Minister Modi at the Tesla Factory," he said.